S-Video, xVGA, and Baseband Video with Stereo Audio, both Baluns and Distribution Configurations. 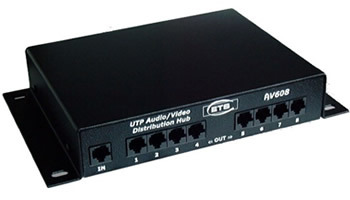 The ETS CAT5 A/V Broadcast System is a UTP Audio/Video Distribution Hub. It has baseband video with two channels of line-level audio transmitted through the distribution amplifier, creating 8 output sets (video + stereo audio) from a single source. The powered AV608 can be cascaded twice (three tiers), yielding a total distribution of 512 displays from just one input source. NTSC, PAL, SECAM or CCTV signals are converted to and from UTP using the AV900 or AV901 Baseband Audio/Video Baluns. Alternatively, the AV602 or AV603 Isolated Video/Audio Source Balun may be used between the signal source and the first AV608. The AV602 or AV603 provides full isolation of the video signal, preventing the visual artifacts that can be caused by ground loops. The AV608 System supports color video and stereo audio over a total run length in excess of 330 meters (inclusive of all cable segments) on Category 5 or better cable. Black and white signals will typically be supported up to 750 meters. The ETS AV790 Series of video camcorder and audio baluns enable video cameras to send HD component signals, composite video signals, and analog audio signals over a single CAT5, CAT5E, or CAT6 UTP cable! Optional configurations: four composite video, HD component video + audio and dual composite video/dual mono-audio. Used in pairs, the ETS baluns support 480p to 1080p video formats. ETS has designed a custom part for a customer for use with SetCom™ devices. The AV790, AV794, and AV796 models used in this application are both highly cost-effective and quickly and neatly installed. The single UTP cable replaces more costly and much heavier coaxial cables. The ETS AV820 Series of High Definition Component Video + Audio Baluns are designed for ease of use and consistent signal labeling in applications that utilize component video signals. Component video formats include RGB, YUV, YIQ and YCrCb. Custom labeling is available for use with your application as required (YCrCb shown above). Due to custom labeling requirements, additional lead times may apply for these products. YCrCb component video is a recent addition to consumer equipment found on some DVD players, high-end televisions and home theater equipment. Professional uses include cameras and VTRs based upon any of the above standards. High Definition Component Video + Audio for high-end home and professional theaters will transmit signals from 480p to 1080p resolution video. AV822 requires two Category 5 cables for transmission. 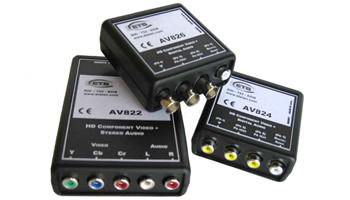 The ETS AV827 is a High Definition Component Video + Digital Audio + Analog Stereo Audio + IR or Data Pass Through balun. This balun is designed for ease of use and consistent signal labeling in applications that utilize component video signals. Component video formats include RGB, YUV, YIQ and YPbPr. Custom labeling is available for use with your application as required (YPbPr shown above). Due to custom labeling requirements, additional lead times may apply for these baluns. YPbPr component video is a recent addition to consumer equipment found on some DVD players, high-end televisions, and home theater equipment. Professional uses include cameras and VTRs based upon any of the above standards. The High Definition Component Video + Digital Audio + Analog Stereo Audio + IR or Data Pass Through balun series is for high-end home and professional theaters that transmit signals from 480p to 1080p resolution video. The ETS AV900 and AV901 Baseband Video/Stereo Audio Baluns are utilized for point-to-point replacement of coaxial (video) and shielded (high impedance audio) cables with UTP wiring, Category 5 or better. 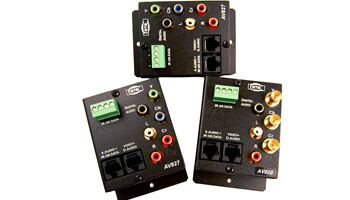 The AV900 (with a FBNC video input plus dual RCA jacks for audio) and the AV901 (with 3 RCA jacks for all inputs) are designed for installations that have a need for separate audio channels. For example, some VCRs and Video Cameras have video plus stereo outputs available on three RCA jacks. 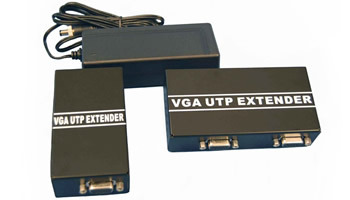 The AV901 can run these signals using three of the four pairs in standard UTP cable. The AV905 and AV906, which allow you to send two channels each of baseband video and audio in any direction desired. This capability yields, for instance, a bi-directional video + mono audio link, or many other configurations. 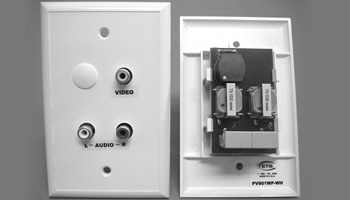 The ETS AV900WP, AV901WP and AV906WP Baseband Video/Stereo Wall Plates which are utilized for point-to-point replacement of coaxial (video) and shielded (high impedance audio) cables with UTP wiring, Category 5 or better. The AV901WP (with 3 RCA jacks for all inputs) is designed for installations that have a need for separate audio channels. For example, some VCRs and Video Cameras have video plus stereo outputs available on three RCA jacks. 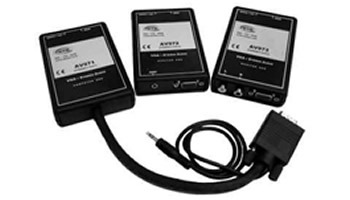 The AV901WP can run these signals using three of the four pairs in standard UTP cable. AV906WP (with 4 RCA jacks for all inputs) allows you to send two channels each of baseband video and audio in any direction desired. This capability yields, for instance, a bi-directional video + mono audio link, or many other configurations. You get the same high quality baluns with the addition of an enhanced appearance of wall plates, giving you a neat, professional installation. 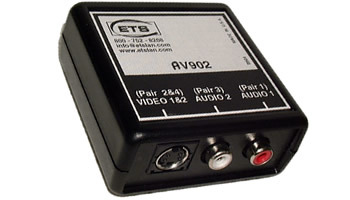 The ETS AV902 S-Video/Stereo Audio Balun adapts Cat5 or better premise wiring for use with Super-VHS, Hi-8 and other "Y/C" format, high quality video signals. 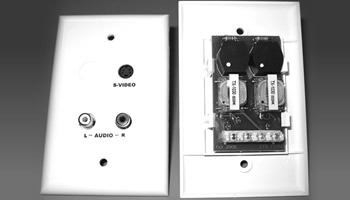 The AV902 uses the industry standard 4 pin mini-DIN connector for video, and RCA jacks for the two audio channels. This arrangement complements the connectors on most high-end consumer and Y/C format professional video devices. The AV902 is a passive (non-powered) device. It is bi-directional, in the sense that identical baluns are used on transmit and receive ends of the run of UTP. Used in pairs to adapt both ends of a run of Cat5 or better cable, the result is clean, transparent video and audio transmitted over distances exceeding 300 meters. The AV918 is a (powered) UTP S-Video/Stereo Distribution Hub which has two channels with audio transmission through the distribution amplifier creating 8 output sets from a single source. The ETS AV902WP S-Video/Stereo Audio Balun wall plates with pre-labeled ports allowing for easy identification and giving neater complementary professional appearing installations. The AV902WP adapts Category 5 or better premise wiring for use with Super-VHS, Hi-8 and other "Y/C" format, high quality video signals. 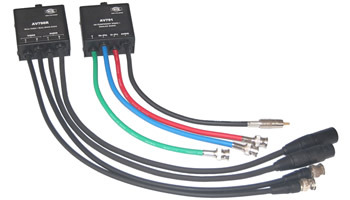 The AV902WP uses the industry standard 4 pin mini-DIN connector for video, and RCA jacks for the two audio channels. This arrangement complements the connectors on most high-end consumer and Y/C format professional video devices. The AV902WP is a passive (non-powered) device. It is bi-directional, in the sense that identical baluns are used on transmit and receive ends of the run of UTP. Used in pairs to adapt both ends of a run of Category 5 or better cable, the result is clean, transparent video and audio transmitted over distances in excess of 300 meters. The ETS AV920 Series of Component Video + Audio Baluns are designed for ease of use and consistent signal labeling in applications that utilize component video signals. Component video formats include RGB, YUV, YIQ and YCrCb. Custom label is available for use with specific application as required (YCrCb shown above). Due to custom labeling requirements, additional lead times may apply for these products. YCrCb component video is a recent addition to consumer equipment found on some DVD players, high-end televisions, and home theater equipment. Professional uses include cameras and VTRs based upon any of the above standards. The AV923 and AV925 enable sending component video and digital audio signals on single run CAT5 or better UTP. Note: AV929 requires two CAT5 cables for transmission. 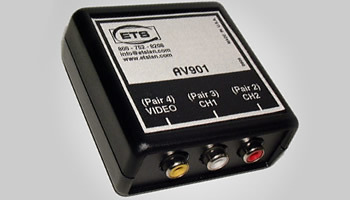 The ETS AV970 VGA Video + Stereo Audio Balun Set allows computer video + stereo audio signals that adhere to the VGA/SVGA/XVGA standards to be transmitted over Category 5 or better UTP cable. All modes and resolutions operate normally. Distance and quality of transmission are dependent on the type of cable used and monitor sync circuitry. Ordinary UTP cabling may be used; however, distance and quality are enhanced with Cat5 or better cable. The circuitry in the AV970 set of VGA video baluns is fully passive, requiring no external power. NOTE: For transmission, two Cat5 cables are required. 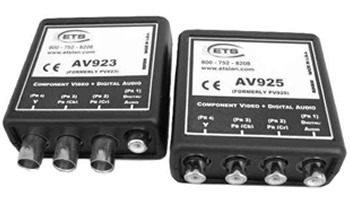 The ETS AV974G Active VGA Video Balun Set enables computer video signals that adhere to the VGA/ SVGA, XVGA standards to be transmitted over Category 5 or better UTP cable up to 500 feet away with resolution up to 1024 x 768 with an added feature for an audio signal. The AV975G (computer end) duplicates the input signal for local use and transmits the VGA + Audio signal to the AV976G (monitor end) broadcasts the signal to a single VGA + Audio outputs. A user adjustment screw for gain and equalization ensures optimum signal clarity. A small screwdriver for adjustment is included.